With great sadness, The Turn lost a very special member of its family, with the passing of Frann R. Zverina on October 19 at the young age of 66. Besides being The Turn’s first female board member, Frann was an incredible individual, who was a tremendous believer in and supporter of the organization and its members. Even prior to her involvement as a stakeholder, Frann was a regular attendee of The Turn’s annual charity golf classic, often being the first to register. 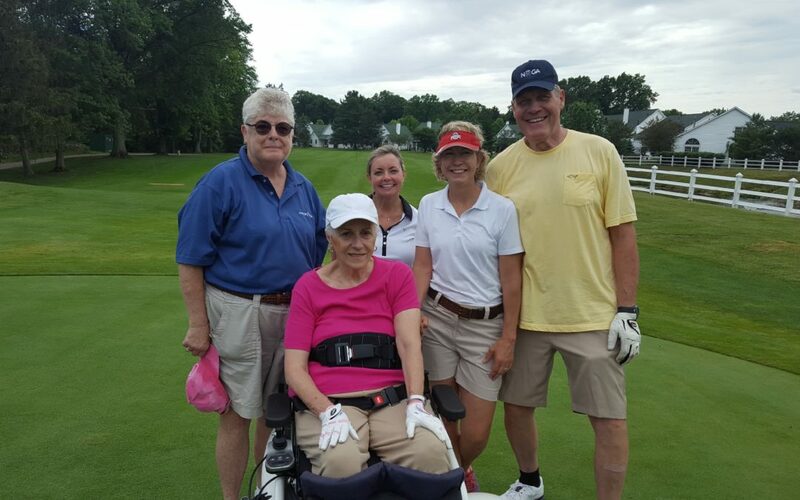 Most notably, Frann fully-funded the purchase of two Paramobile devices for The Turn, providing “game-changing” fitness and recreation opportunities to individuals with spinal cord injuries, like Barb Fitz who is pictured with Frann (left) in the photo above from the annual Fellowship Outing. Frann was diagnosed with cancer in early 2017, and while her condition seemed to be improving, a check-up in June of 2018 revealed that her condition had significantly worsened. Frann continued to be an active supporter of The Turn, even though she wasn’t able to volunteer with the programs or attend board meetings. As you can see from the short interview conducted just before her passing, Frann truly understood what it meant to “get involved” as a friend and stakeholder of The Turn. What about The Turn attracted you to get involved as Board Member? There were so many reasons to get involved, from its accessible facilities, incredibly unique programs, its professional staff and dedicated volunteers, and, most importantly, its measurable impacts on people with physical disabilities. Not to mention, it centers around one of my favorite recreational activities. Having served on numerous nonprofit boards, what philosophies have you found to be key for board members? It is essential for new board members to understand what it means to “get involved”, which includes offering their “time, talent and treasure”. This time-tested phrase asks individuals to support the organization by volunteering their time for programs, attending special events and participating in board meetings, their talents within their professional field, and with their treasure to financially support the organization. Can you reflect on your favorite personal moment or memory from your time with The Turn? Hands down, I will always be thankful for the opportunity to meet Barb and Denny Fitz during the inaugural Fellowship Outing. To see first-hand how the Paramobile has impacted their lives and hear their wonderful story, is something I will never forget. What excites you the most about the future of The Turn? The momentum achieved over the past few years, especially in the past 12 months since the name change to “The Turn”, has been incredible to witness. The community has truly begun to embrace and recognize the organization for its measurable impacts on people with disabilities. I think this is just the beginning of more exciting things to come.